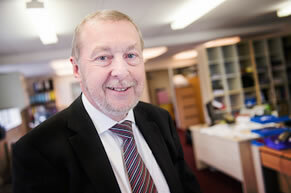 Having originally trained in industry, David became the company accountant at a foundry which employed over 150 workers. Following that, he trained and worked as an Independent Financial Adviser in a firm where he also worked to start their accounts department. From there, David took the bold decision to strike out on his own as a sole accountant. He’s never looked back since. David’s drive to succeed has been a key factor in Alexander Accountancy’s success – but he’s no stranger to taking on big challenges. David has climbed to the summit of Tanzania’s Mount Kilimanjaro three times and in 2005, he helped his wife Gail to reach the top. As Gail is registered disabled, it’s what he describes as his most satisfying achievement. With the mountain peak sitting 5,895 metres above sea-level, it’s a fantastic feat for them both. Hill walking and trekking are major passions for David and Gail, and they’re never happier than when outdoors gardening or in the company of the various dogs that they have owned. They currently own a border collie and are fostering a second dog.